I’m not usually a fan of pesto. I never order it, decease and avoid fancy sandwiches that are adorned with the stuff. It’s usually so oily that I can’t taste anything else. And who wants to taste pesto instead of mozzarella or Gouda or prosciutto? Not me! But I had all of this lovely, bronchi purple-tipped asparagus and I am just a bit bored of roasted asparagus. Since the pantry and fridge were devoid of anything other than grains, help beans and fire-roasted tomatoes, I didn’t have many options about what to do with my asparagus. So, I roasted it and made a pesto, figuring that I could go lighter on the oil because the juicy asparagus would compensate. I also used pistachios instead of pine nuts because it’s what I had, and I threw some roasted mushrooms in for texture. Feel free to play around with the toppings. I used roasted mushrooms here, but this would be equally delicious with grilled steak, chicken or sausage. You can also top the pasta with some freshly toasted breadcrumbs, chopped black olives or poached eggs. Special equipment: Food processor or blender. Cook the pasta in well-salted water. Preheat your oven’s broiler and line a cookie sheet with foil or parchment paper. While the pasta cooks, line your asparagus in a neat little row on the cookie sheet, then surround it with the mushrooms. Drizzle with 1 tbsp. of the olive oil and sprinkle with coarse salt and freshly ground pepper. Place on the middle rack of the oven and roast for 10 minutes, or until the asparagus is beginning to brown and crisp. Remove from oven and place in a food processor with the spinach, lemon juice, garlic and olive oil. Pulse until all the large pieces are gone, then add the pistachios and pulse about 5 times so that the pistachios are in pieces, but are big enough to give some crunch. Toss with drained pasta and the roasted mushrooms until well-coated, then sprinkle with freshly grated Parmesan cheese. I love this idea! 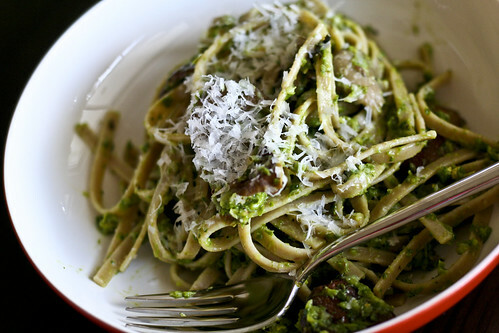 I never thought of making asparagus into a pesto but I’m definitely going to give it a try. Thanks Helen – I could eat this all the time. But then, any big bowl of noodles is just fine with me!